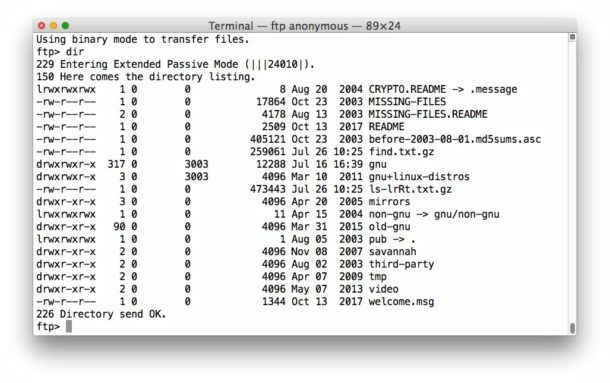 Mac command line users may have noticed that FTP is missing from the latest versions of MacOS system software, but despite ftp not being included in newer versions of system software by default, you can still install ftp on Mac OS if you need to use an ftp client or run an ftpd server for whatever reason. For some quick background, modern versions of Mac OS pulled ftp to instead emphasize SFTP usage. Likewise, telnet was removed in favor of ssh. These decisions were probably made to favor the more secure encrypted protocols of SFTP (and ssh), but nonetheless some users may still need to regularly use the older ftp transfer protocol, even if it’s not particularly secure. Accordingly, certain Mac users may need to install and run ftp as a client, or ftpd as a server, which is who this tutorial is geared for. If you don’t need ftp, there’s no reason to install it. If you have not already installed Homebrew on the Mac, you will need to do so before beginning with this particular approach. One of the obvious perks to installing ftp and ftpd server with inetutils is you get other helpful network utilities, so you won’t need to manually install telnet on the Mac if you need that, it will just come in the same package together. Whether you want to install the full inetutils package, or tnftp alone, is entirely up to you and your specific needs and requirements. And then you’re good to go with ftp, telnet, and the other network tools, all by compiling them from scratch. If you have another solution to getting FTP and an FTP server on a Mac (and no, not SFTP which is different and already included), share with us in the comments below! The command line ‘ftp’ client is useful too, but if you’re not a command line user it makes ftp connections more challenging than they need to be simply to connect to. It’s also probably notable that installing ftp at the command line also installs the ftp server. I personally use SFTP with regularity, but a lot of web hosts and other platforms are removing SFTP access too, favoring git and other version controlling tools. I dont understand the point of this article. High Sierra is supporting FTP at least in read only mode. After the described instalation it will be able also to write data on FTP server? It is OK, if you do not understand the point of ftp then you don’t need ftp ;) I think the same thing about Adobe software products … ha ha! OK a bad joke, maybe. Try running ‘ftp’ at the command line, without ftp installed it will not run. I think that unless you need ftp server, you can simply use the ftp clients like Transmit or Cyberduck, no reason for command line for most Mac users. How can I run a FTP server after I installed inetutils? To start FTP server you must run FTPD which is the ftp daemon. Then ftp to the IP, login with standard shell. gives error: 550 Can’t set gid. do you have any better instructions to get this to work? If you don’t have ftpd installed then ftpd will not run. But you should use sftp not ftp, ftp is not secure. I’m running into exactly the same issue (on Mojave 10.14.3) – could you resolve it in the meantime? If you just need to squirt a file off from time to time with ftp, just copy the /usr/bin/ftp program from Mavericks, or perhaps later versions… it works just fine and you won’t clutter up your system with all this other stuff. None of this seems to work on Mojave 10.14.2. I also installed this commercial FTP server (“FTP Server” in the app store) on Mojave, and it works fine. If you don’t have homebrew on your system, I’d say the $4.99 is a cheaper way to go. Haha do not pay money or install extra software if all you need is ftp download. Simply use cURL which has not gone away. Homebrew is free, so is ftp and sftp. Homebrew is a package manager, ftp is a client/server protocol to transfer files. How do I get ‘ftp server’? Also, I’m unfamiliar with FTP setup so I was wondering how do you set it up? Like create a username, hostname with FTP server?